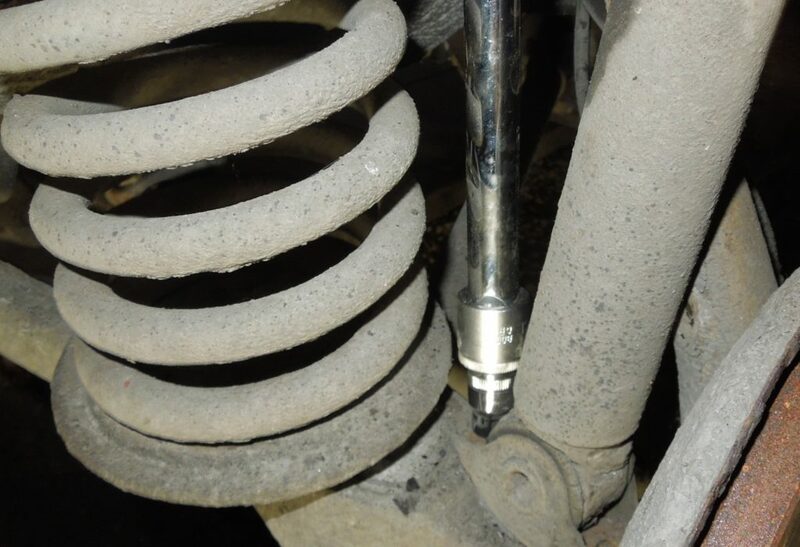 Changing the shock absorbers is pretty easy and will save you a lot of workshop bills due to the fairly long time it just takes to get it done on all four wheels. I had to change all the four shocks due to wear and age on my coupé. It handled more like a boat than a fast coupé in the corners in the end. I recommend buying high quality shocks from Bilstein, they come in two different options: Heavy duty shocks that give less body roll and the Standard comfort shocks for super smooth highway cruisers. I prefer the Heavy duty ones for using the car on twisty roads. And oh boy what a difference it makes, now it can take corners almost like a modern car down twisty narrow Norwegian roads. Worth the all the effort and money!! So How do you change these shocks and what equipment do you need? Firstly buy your new shocks. I really like Bilstein, but it’s up to you and your budget. Always change both shocks on the same axle! Then you need a special 10mm socket with 12 teeth to loosen the lower fittings on the front chocks, see the image below. You always have to remove the upper shock mounts with the car on the ground, so wait with raising the car up just yet. 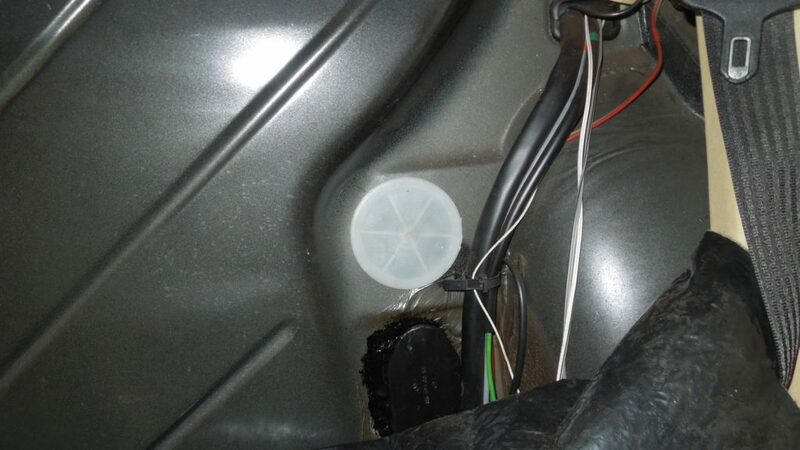 Start with removing the back seats if you plan to change the rear shocks. The back cushion for your asses are removed with just pressing two plastic tabs at the front and just pulling up on the whole cushion. The rear backrest is held in place by three sheet panel bolts on the lower edge. To pull out the backrest just pull upwards and it will come off. Now wiggle it out of the car, easier said than done on the coupé. In the sedan you have some more space to move around. 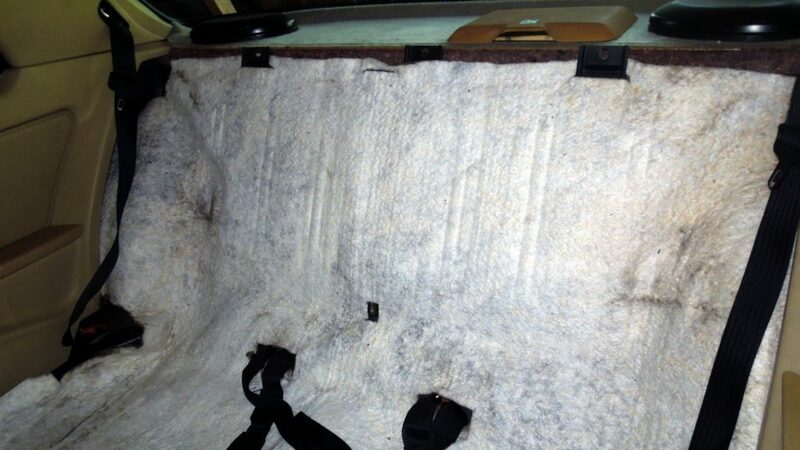 With the rear seat removed, uncover the holes for the rear shock absorbers by looking behind the soundproofing cover. Pry open the white plastic covers and you will find the upper mounting on the rear shocks. 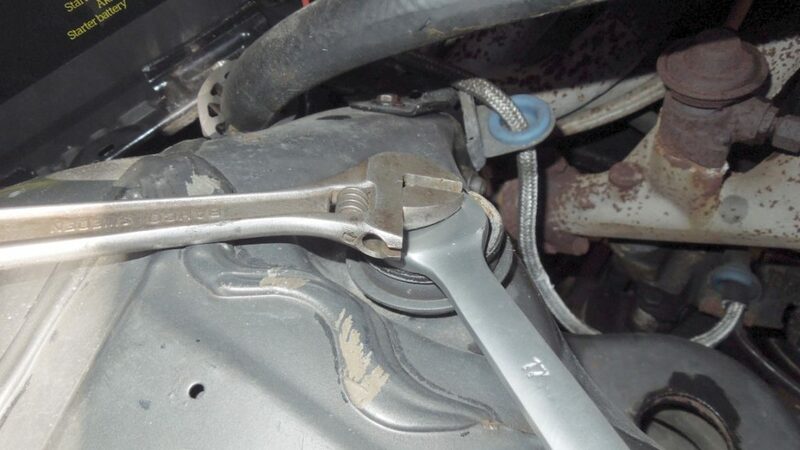 To unfasten them, have a adjustable wrench to grip the flat upper part of the shock absorber rod still while rotating the mounting bolts with a 17mm wrench. 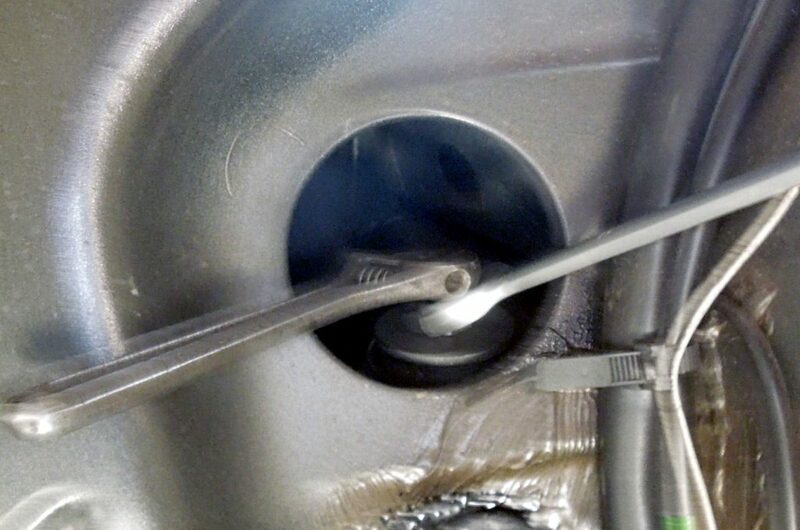 Then open the hood of the car and unbolt the upper front shocks. Now it’s time to jack up the car and place it on jack stands. Find that special socket and a long extension, I mean really long. The socket is for removing the two front nuts on the front shocks. Always star start on the outer one towards the wheel, because you have to angle the whole shock outwards to access the inner one. It is very important that you remove all the rust or dirt that is on this nut to get maximum grip. It is usually very tight and you don’t want to round off this one! Make sure that the socket is sitting all the way down tightly and use your strength to break it loose. I actually had to lift up the suspension arm with the jack so I could gain enough clearance from the wishbone to the outer nut. Pull down the gas piston down to being able to angle the shock outwards to gain access to the inner nut on the lower mounting. If the shock is very stiff, use a pry bar for leverage. When this last nut is removed, you can just remove the old shock. 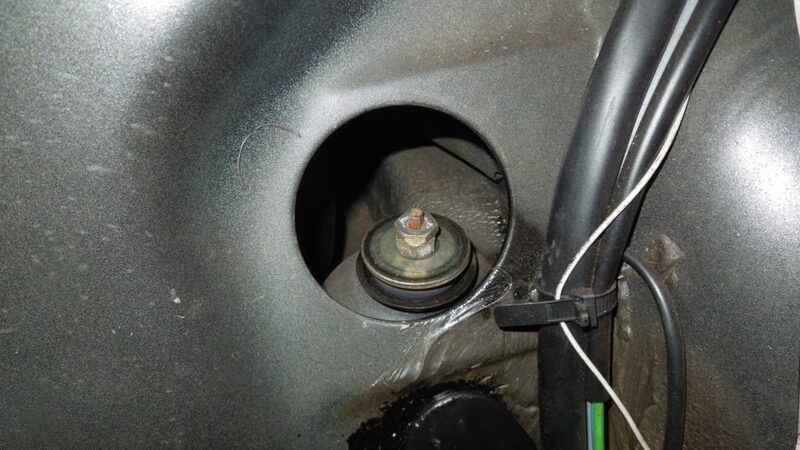 Make note of the placement of all the bushings and shims, but it might be that the new shock has a slightly different mounting arrangements, then you should refer to the instructions provided with the shock. The rear shocks are easier to remove. After the top nuts have been removed. Then just unbolt the two big bolts in the middle of the trailing arm. 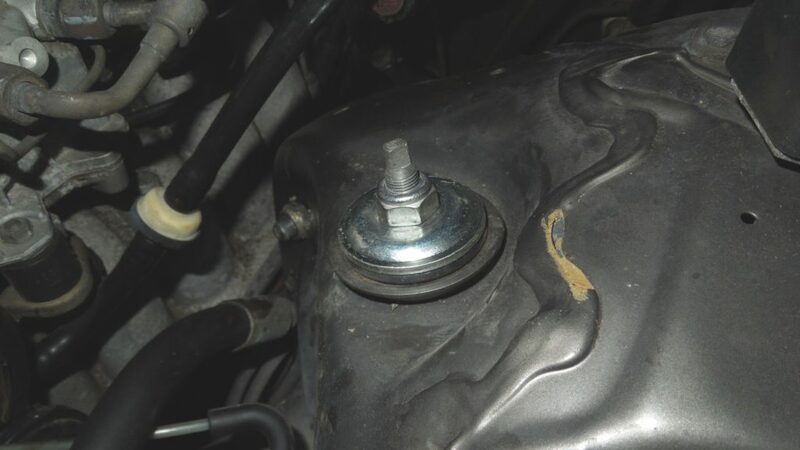 Be careful holding the shock when removing the last bolt so you don’t end up with the shock falling on your head while you are lying on the car. 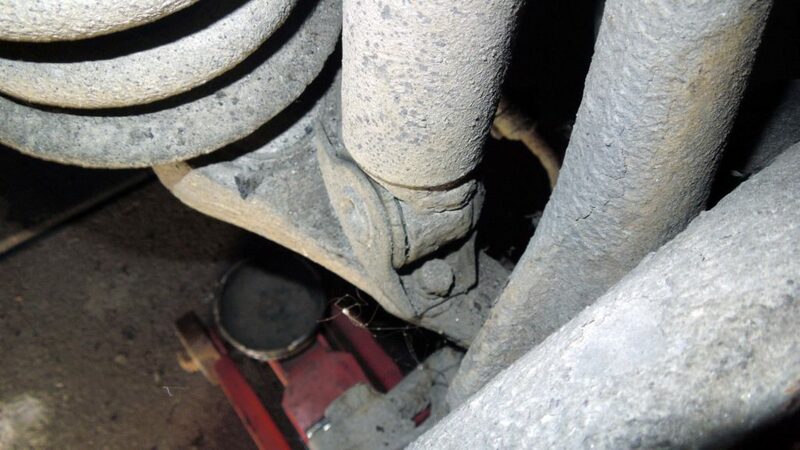 You need some ground clearance under the car to be able to withdraw the shock from under the trailing arm. Reassembly is pretty much reverse of the disassembly. 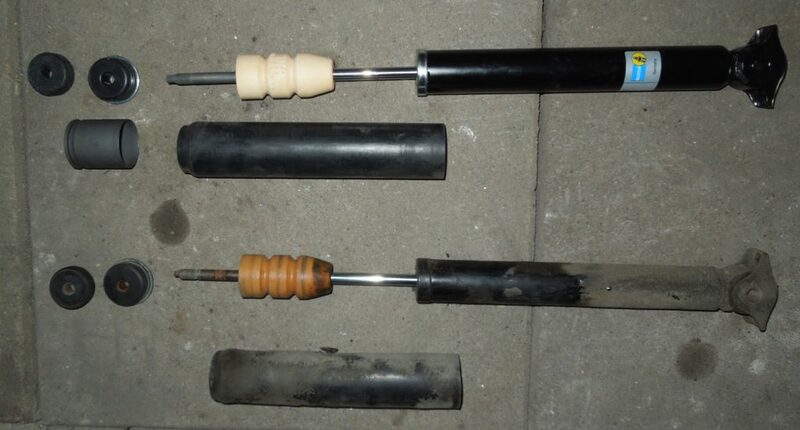 Be careful of not rotating the shock absorber rod too much when tightening the top nuts, since it might damage the internal gaskets and the new shock absorber will start leaking. Start with torquing of the lower bolts are done when the car is raised on the jack stands, and only do the last torquing of the upper mounting nuts when the car is resting fully on its suspension on the ground, like when you removed them. The front lower bolts need 19Nm and the upper ones are tightened until the rods are at some height above the hold down plate. Don’t over tighten excessively. This is usually given with the shocks or you can look at how the old ones were before you remove them, given that they are of same type. 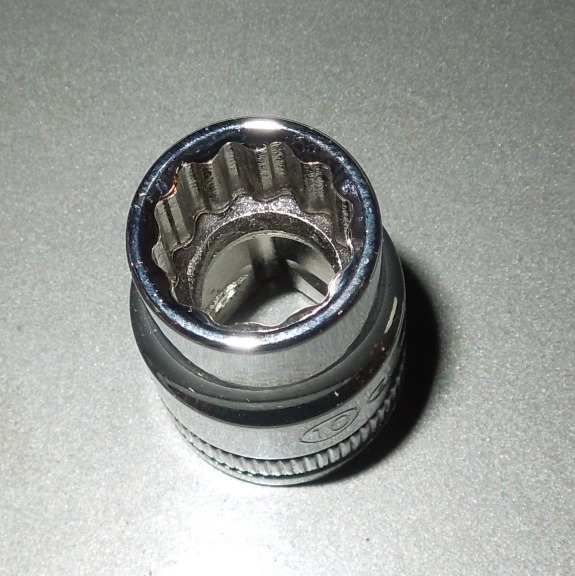 The top nut can either be in pairs or like this one with a bolt with plastic inside. I had to reuse the old dust guard cloth from the old shock and fit it to the new shock before I installed it on the car. So be careful taking it off and not to rip the cloth. The new front shock came though with a new plastic dust cover. Finally installing the rear shock is reverse order again. Good luck. The rear lower bolts have high torques of 45Nm while the upper mounting is tightened when the car is resting on the ground and to some height of the rod above the hold down plate. Good instructions. Just changed front & rear on my wife’s ’84 280CE. I managed to snap a jaw off a 17mm open ender trying to undo the two lock nuts on one rear shock. They were so tight I had to use a pipe for extra leverage – and bang! Never done that before. Used a better quality tool and got it undone. The other side was easier. Btw, it is a 10mm 12 point socket for the front shocks. Had to use a 3/8 drive to fit. Just took the car for a drive and it is much better, corners much flatter. Thanks Dave for the correction, been a while since I used that tool and got it wrong. Article now corrected to 10mm. Glad to hear you got a nice result after changing the shocks.